Volvo Car Taiwan Ltd., the first wholly-owned local subsidiary of the foreign carmaker Volvo Car Corporation (VCC) of Sweden, recently announced to kick off another investment project on the island to introduce more new models and renovate all its sales points throughout Taiwan starting this year, with the targeted investment to be about US$100 million, the largest since the global financial meltdown. Volvo Car Taiwan was set up in 2002, and in 2008 the Swedish headquarters decided to pour about US$33.3 million into overall showroom renovation on the island, a project that was sidelined till 2010 by the global financial tsunami from late 2008 to 2009. According to Volvo Car Taiwan's plans, the subsidiary is scheduled to increase its showrooms in Taiwan from 18 to 22 or 24 over three years. To meet the required Volvo Retail Experience (VRE) criteria, to set up a new showroom in Taiwan costs between NT$200 million to NT$300 million (US$6.67 million to US$10 million), while renovation of an existing dealer takes about NT$50 million to NT$100 million (US$1.67 million to US$3.33 million). In addition to dealership construction and renovation, Volvo Car Taiwan also plans to restart recruitment of new distributors, so as to find more good distributors to build up stronger sales force against other imported luxury car brands. Starting 2016, the local subsidiary said the brand-new Volvo S90 luxury sedan and V90 luxury sport utility vehicle (LSUV) will be introduced to local consumers, and the two models are expected to further raise the local sales volume. L.J. 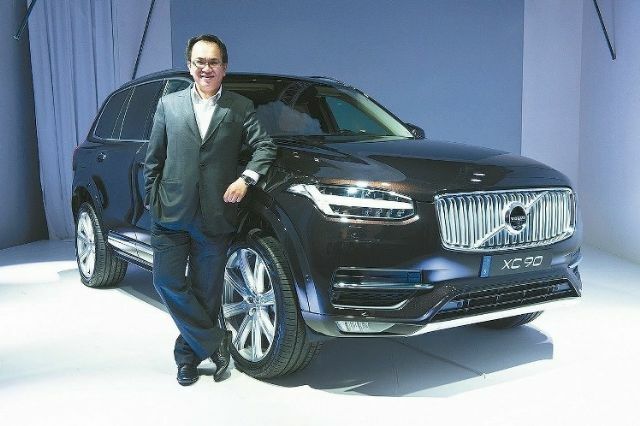 Chen, Volvo Car Taiwan's president, pointed out the newly introduced Volvo XC90 LSUV will be a significant addition for Volvo Car Taiwan to win higher share in the booming domestic SUV segment, while his company has been preparing the local sales of the new model. Chen said that Volvo Car Taiwan aims to sell 5,500 new cars on the island this year, crossing an important volume threshold to motivate local distributors to jointly invest in future business development. As of the first half this year, Volvo has won an 8.8 percent share in the local luxury-car segment, and the local subsidiary targets a 10 percent share buoyed by expanding sales. A local Volvo distributor said that Volvo's new investment plan in Taiwan indicates profitable operations, as well as a clear sign of, after Chinese automaker Geely Automobile Holdings Ltd.'s takeover of the Swedish nameplate, the company's new strategies to develop sales worldwide. Industry sources noted that after Volvo was acquired by Geely in 2010, the brand's operation in Taiwan seemed to have taken a backseat in the past few years. But the new investment project represents Geely's restructuring plan for Volvo has achieved a scheduled goal, with the next stage being to aggressively develop the brand's sales in different markets. Volvo is not the first international luxury-car brand to have invested in Taiwan to further grow sales. Earlier the wholly-owned local subsidiaries of German brands Mercedes-Benz and Audi had also poured sizable sums in expansion to have reaped fruitful rewards in recent years. Although BMW has not set up a fully-owned local subsidiary, the German nameplate has been pressuring its local distributor Pan German Motors Ltd. to steadily expand; while Hotai Motor Co. Ltd., the Lexus agent in Taiwan, is also expected to carry out investment projects to join the luxury-car sales battle on the island. The import-car segment in Taiwan has been rapidly expanding in the past two to three years, and imports have achieved record high market share for some time. Driven by the 10-year replacement peak in the local automobile market, the uptrend in prices of locally assembled cars, and introduction of price-friendly, entry-level models by international luxury brands in Taiwan, local consumers have more reasons to change new-car purchase habits by considering imported makes and models. Imported cars used to account for sub-20 percent market share over the years in Taiwan, but such figure has risen to more than 45 percent, or even 50 percent in the past two years. Such market share shifts between imports and locally-assembled cars are to intensify as many local agents of international brands have terminated some locally-made models by direct import, especially mid-sized sedans.